or Duncan on 07831 336814. DW Lyon Agricultural Contracting Ltd provides a full range of services as listed to the left. Please click on the links to find further information on these services. Until 2006 DW Lyon was based at Quothquan Mill Farm, which has been in the Lyon family for 118 years. In June 2006, DW Lyon moved to Arthurshiels. This is the principal premises of the company, and has purpose built sheds for the agricultural contracting business & one for the Firewood business. We are thinking of offering the service of winter feeding with a diet feeder which would come to your farm each day to feed stock throughout the winter months. There is also the potential to do the same service for straw chopping. Please contact us for further information about this new service. 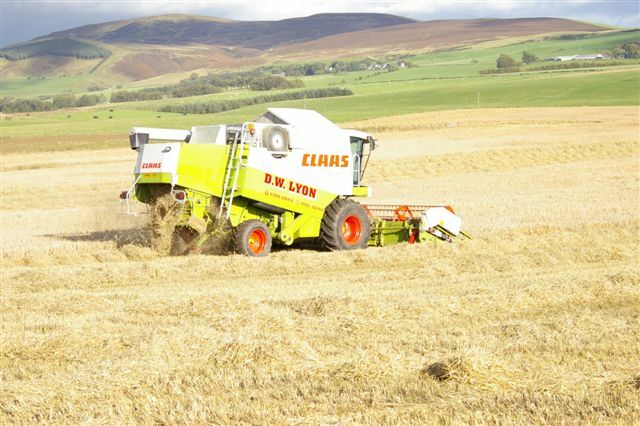 The agricultural contracting team consists of Duncan Lyon owner & fully experienced machine operator for over 25 years, three full time employees again with full machinery expertise and a team of part time employees to cope with the seasonal demands of the business. All of our employees come from a farming background and between them they have a vast amount of experience. Our two combine drivers have over 60 years experience between them! The team at DW Lyon provides a reliable, competent service for all your agricultural & land management needs.